People will not grow into Christ-likeness if they do not line up with who He is and what He says. 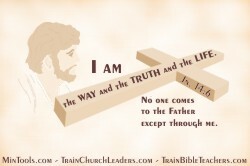 Jesus is Truth, with a capital T. In John 1:1, Jesus is called "the Word." He is God Incarnate, come to this earth "full of grace and truth" (Jn. 1:14) to take us out of darkness and into His glorious light. We are then to "live as children of light (for the fruit of the light consists in all goodness, righteousness and truth) and find out what pleases the Lord" (Eph. 5:8-10). We are to let our light shine before men (Matt. 5:16) which includes truth shining through our lives into the darkness around us. The Church must stand on and align with the Truth if we are going to be the "pillar and foundation of truth" God intends for us to be in the world (1 Tim. 3:15). Otherwise all we have is an empty creed that does little to affect change in this world. It's easy to say we believe something but another thing to act on it. James 2:19 says that even the demons believe. As a leader you must help people understand that God has expectations for people in regard to truth. They must make a choice of what to do with it which will come with consequences. They can live by the truth (Jn. 3:21), obey the truth (Gal. 5:7; 1 Pet. 1:22), believe in the truth (2 Thess. 2:13), know the truth (1 Jn. 2:20-21), correctly handle the word of truth (2 Tim. 2:15), walk in the truth (2 Jn. 1:4; 3 Jn. 1:4), and be firmly established in it (2 Pet. 1:12). They can suppress truth by wickedness (Rom. 1:18), exchange the truth of God for a lie (Rom. 1:25), or outright reject it (Rom. 2:8). Disregard of truth, as in the second option above, puts us on the side of the devil who has no truth in him and does not hold to truth (Jn. 8:44). Is that where we want to be? And, it leads to the wrath and anger of God (Rom. 1:18; 2:8). Do we want God's displeasure which yields a lack of His blessing on our lives? Do we not realize that following our own ways only leads to problems and even destruction or death (Prov. 14:12) rather than the fruitful and abundant living that comes from lining up with Him (Ps. 1:1-3)? As a leader you need to reinforce this applicational approach to truth by being an example, by showing the link between your decisions and actions to the truth of God's Word, by building some form of accountability into processes, and by laying before people the consequences of the choices they make.